This river cruise through central Europe will take you from Remich to the gothic skyline of Prague on the Moselle, Rhine, and Main Rivers. 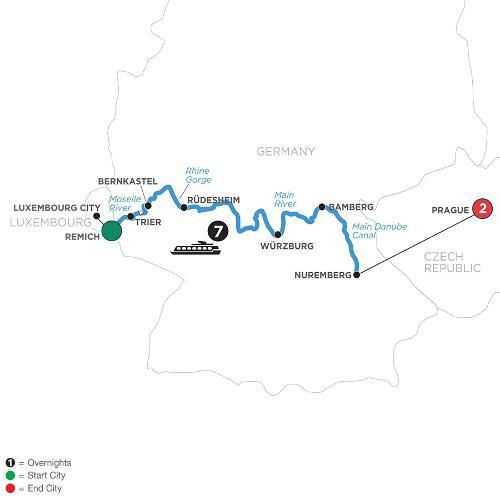 Embark on your European river cruise in Luxembourg on the enchanting Moselle River. Make your way to the ancient city of Trier, Germany—believed to be even older than Rome. Many remnants of an-cient Rome can still be found, such as imperial baths and the Roman Bridge. The wine village of Bernkastel, with Germany’s largest expanse of vineyards, will fascinate you with its narrow streets and half-timbered houses still standing from the Middle Ages. Continue through the dramatic Rhine Gorge—considered the most beautiful view of the Rhine River—and see the rock of the Lorelei and ancient castles standing majestically on cliffs 400 feet above the water. Stop in Rüdesheim, a quintessential Rhine Valley wine town, before proceeding into the Main River. Visit the magnificent Bishop’s Residenz in Würzburg and marvel at medieval Bamberg, a UNESCO World Heritage Site. Your journey concludes in Prague, one of Europe’s most magical cities. See its treasures, such as St. Vitus Cathedral, a gothic masterpiece that dominates the skyline, the Astronomical Clock, and Charles Bridge—the oldest bridge in the city. In your free time get a taste of the local cuisine with plum dumplings and Pilsner—the perfect ending to this unforgettable European river cruise vacation!